It is the weekend again and it is too hard to sleep in when I know all the girls want to get out of the barn. 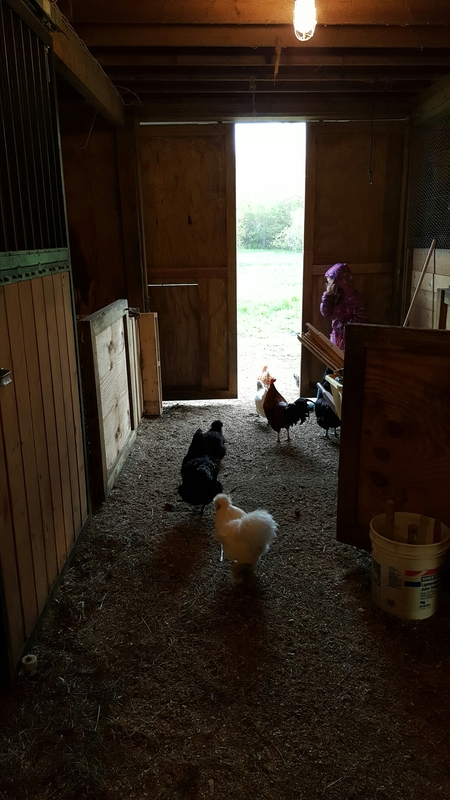 I havent completely gotten comfortable of having all the chickens free range day and night. Sadie is the same way in the mornings and helped me open the doors for everyone today. We were off running right away today as we begin to finalize details for the goats. The plan is to bring them home in a week. After talking with several people I decided to settle on purchasing Big Gain feed for the goats. Very different from the chickens there is not a clear recipe in feed goats. When I researched the chickens the choices were organic or not and everyone agrees on when to change from grower feed to laying feed. Goats, however, people have several formulas along with percentages of different ingredients. There are also several supplements you can provide depending upon your own opinion. Of course when you don’t know what you are doing having so many choices just adds confusion. I have been blessed in the process that there are several other neighbors who have knowledge and have given me some advice. So, off to get the goat feed. 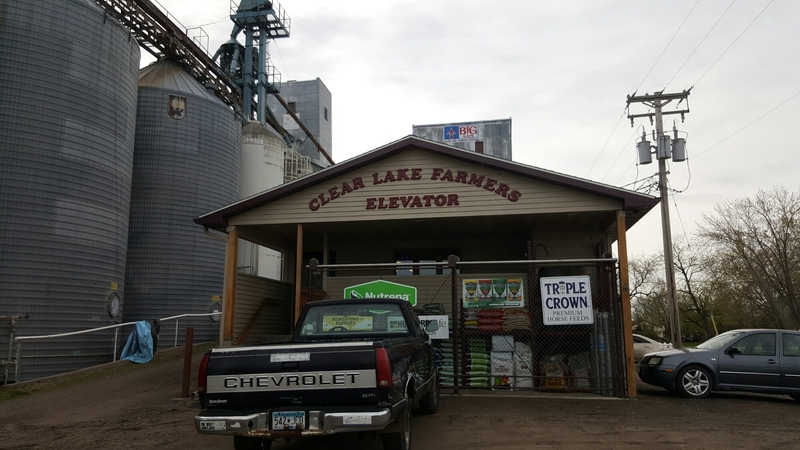 To bad part of this is the feed store near the house doesn’t sell Big Gain Feed so Sadie and I headed to Clear Lake. They had everything I needed so made a quick stop to see mom and had to stop at our favorite gas station off of 94 and 24 before we headed home. 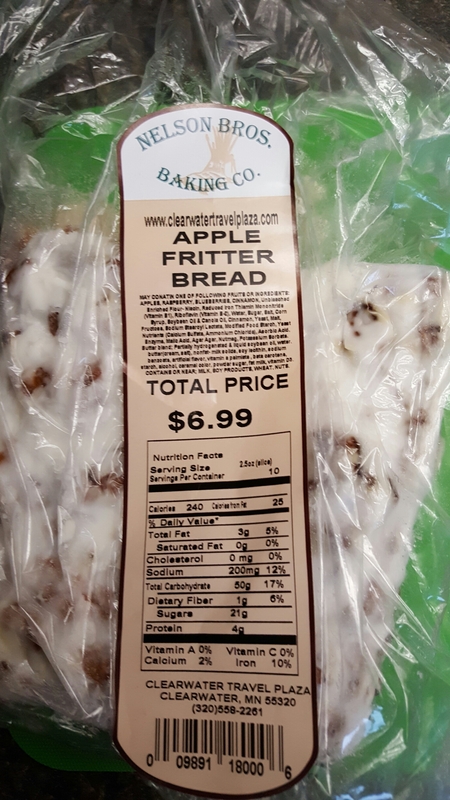 We grabbed some Caramel Apples and fritter bread. Hmmm. Finally headed home to work on the barn and garden. One other new discovery since the westher has finally stopped raining, we found out just how much work it takes to mow our lawn. We still have a push mower from living in the cities and let’s just say it took us Friday night and Saturday morning to get the lawn completely done and both Dustin and I got quite a workout. 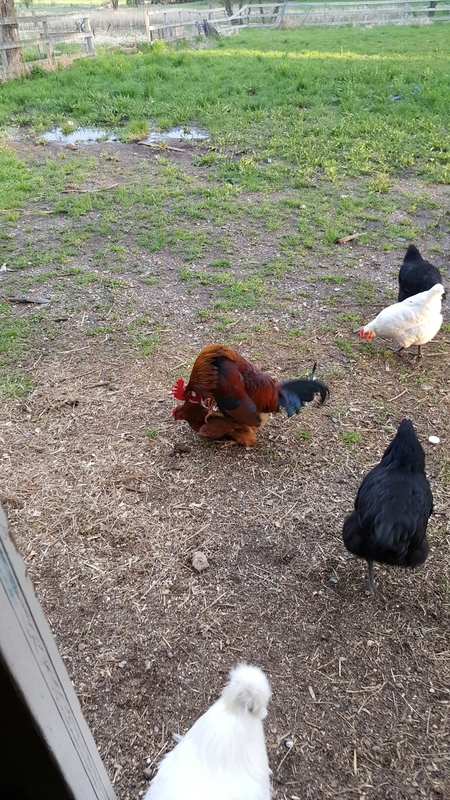 One of the other common scenes we see in the mornings is the hunt for the roosters to do their dance and find a hen who will not run and allow them to hop on their back. I figured I would include everyone else in the show. In doing research, I discovered one new fact about roosters and hens I previously didn’t know or at least never cared to know is that roosters spray when they mount a hen. 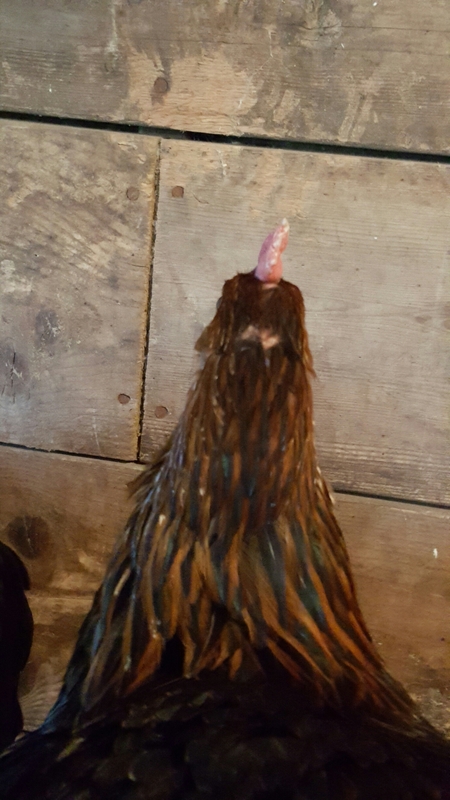 I have also noticed poor Martha is starting to get a bald spot from getting mounted. The roosters grabbed the feathers on the back of the head when they mount. By the end of the day, I am super proud that we are officially ready for some goats. 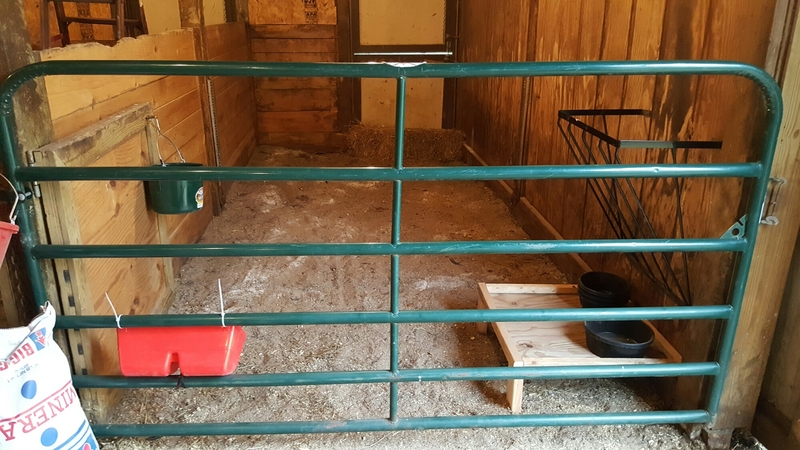 We added the gate, mounted the hay rack, mounted mineral rack, and built a catch tray for the dropped hay. 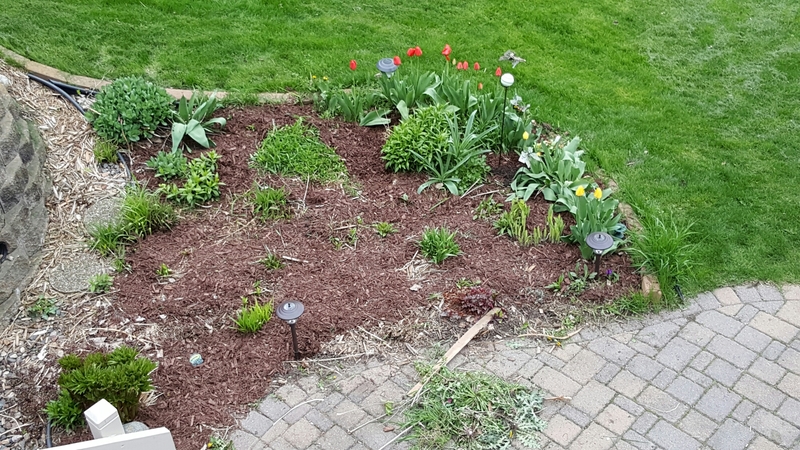 One other task we were able to cross off the to do list this weekend was to finish planting the vegetable garden and mulch the perennial gardens. 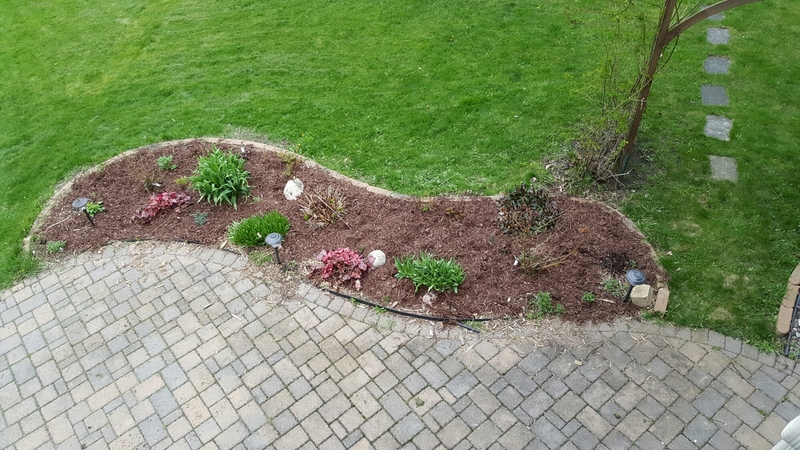 Looks pretty good for a days work. ← Not quite as we had planned.